NEW YORK (CNNMoney) -- Total student loan debt has topped $1 trillion ... but there's no need to panic. In the fall of 2010, there were 22 million undergraduate and graduate students in college, the U.S. Department of Education reported this week. Two years ago, the figure was 19 million. "Enrollment has increased dramatically, so of course debt is growing," Baum said. More undergrads also needed to borrow to finance their educations, especially since tuition costs have also been rising fast. Some 82% of first-time, full-time students received financial aid in the 2009-2010 school year, up from 76% two years earlier. Their individual debt load is on the rise, as well. 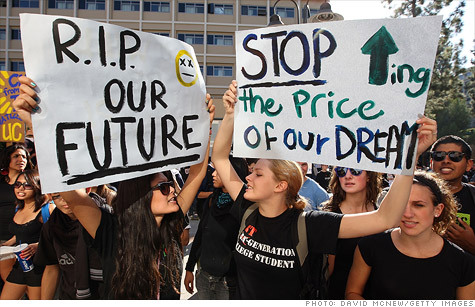 The average amount of student debt in 2010-11 was $27,200, up 54% from a decade earlier, according to Finaid.org. But that figure is skewed by a relatively small number of people who have high debt loads, said Kantrowitz. They are mainly graduate students, people who took out a lot of private student loans and those who have been in default for years. Only 10% of borrowers have more than $45,000 in loans, Kantrowitz said. Some 90% of new student lending comes from the federal government, and the amount undergraduates can borrow is generally capped at $31,000. This jump is being fueled in particular by for-profit colleges, which have default rates of 15%, prompting federal officials to put in new rules. Now, schools with excessive default rates can lose their eligibility for the federal loan program. Still, heavy debt loads can make it tough for young adults to establish themselves, especially these days. The Great Recession has made it tougher for young adults to find a job. The unemployment rate for those age 16 to 24 with bachelor's degrees stood at 8.1% in February, up from 4.6% four years earlier. Many others find themselves underemployed. "Having a lot of student debt can make a person's life very difficult," said Lauren Asher, president of the Project on Student Debt. But workers with bachelor's degrees earn about $650,000 more over their lifetime than their peers who only have high school diplomas, a recent Pew Research Center analysis found. "It's an economic investment," said Sarah Turner, professor of economic and education at the University of Virginia, Charlottesville. "It's not going to work for everyone, but on average, it has a high return." Kantrowitz expects defaults to climb for another year, before starting to decline. That's because the economy is slowly strengthening and unemployment rates are coming down. "The defaults are not unexpected, considering the aftermath of the downturn," he said.